Eric Clapton's autobiography provides a good measure of fun for lovers of rock&roll. The book does not just contain rock&roll information about the uber-successful musician but also interesting tidbits about his zeal for collecting art, hunting and fishing, and his reflections about the self-destructive choices he made as a younger man. And of course, there's Pattie Boyd and Clapton's life-consuming obsession with George Harrison's wife. It's sort of like reading about the Lancelot-Guinevere-Arthur triangle in a rock&roll, 20th-century setting. 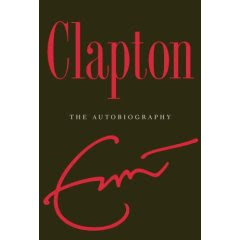 The new Clapton release is an interesting read for the holiday season. It's got it all: the drama, drugs, unrequited love, and of course, rock&roll. didn't he end up marrying patty in the 80's? 'Layla' was for Patty, right? Yes, he did as per his book. And I believe Layla was indeed written for Patty.